In January Ontario's government is introducing a new price support program to help poorer households with electricity costs. The planning for the program reveals an expectation that 1 in 10 Ontario households can not longer bear rising electricity rates. Ontario's electricity system mandarins released an astronomical estimate indicating November rates will be 20% higher than ever before. CBC's flagship news program broadcast a poorly researched segment, "Canada's clean energy race." Examining the Samsung numbers for high-priced November might provide a simple explanation of what the global adjustment is, but some background is necessary to judge the value Samsung has delivered. Chris Brown's CBC report included segments interviewing Tim Smitheman, once a public servant, now an employee of Korea's Samsung further aiding that company in siphoning money out of Ontario. Brown celebrated Samsung, but any investigation would have revealed he could not have picked a better subject to display the failure of Ontario's green energy foibles. A brief history lesson is necessary to communicate how poorly Samsung has performed for Ontario. In 2008-09, Minister of Energy George Smitherman and his boss Dalton McGuinty wanted to make a big splash to kick off the glorious renewables future German politicians and David Suzuki had convinced them was imminent. In January 2010 the government inked a deal with a Korean Consortium that included Korea's electricity experts, KEPCO (since departed the Consortium), and Samsung. The deal, "would see the consortium receive preferential treatment from the province, in the form of priority access to the energy grid and higher-than-market rates for the renewable energy it creates as part of Ontario’s new feed-in-tariff (FIT) program." The Samsung deal has been a disaster. Hopes that expertise in LCD displays would lead to breakthroughs in solar panel manufacturing tech Samsung would base in Toronto disappeared, as did hopes expertise in shipbuilding would translate to breakthroughs in wind turbine design to be based in Ontario. All those things were sub-contracted out. The Korean Syndicate seems to have abandoned any attempts at being an active participant, or an active investor in Ontario. The first industrial wind project under the deal is reportedly now under construction - by a sub-contractor financed through an outsource partner (Pattern); Samsung's $7 billion promise to kickstart an industry became a $300 million investment with the remainder to come slowly, and only out of payments made on the initial investment. Two months later the government took advantage of the failures of the consortium to accomplish anything timely, and pared back the contract, claiming "an estimated $3.7 billion reduction in contract cost..."
Not one of the Samsung generators, contracted as the bold stroke in a strategy where renewables could be credited for replacing coal in Ontario, entered commercial operation until coal-fired generation at the Lambton and Nanticoke generating stations had ceased. The only category of electricity Samsung has since produced is "excess". Unfortunately CBC viewers will know none of this. Brown reported Samsung had made a "$5 billion bet on Ontario’s renewable energy sector,” which likely was an exaggeration by a factor of 10. 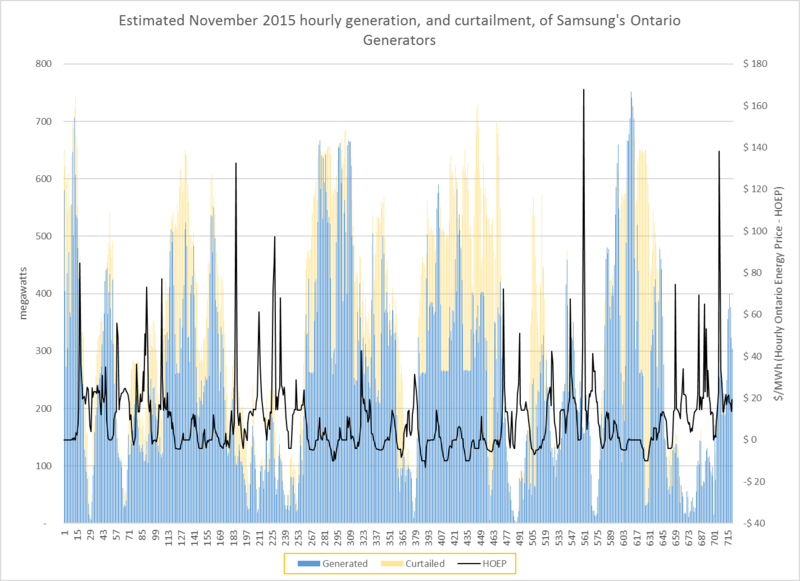 In November Ontario's system operator added the 100 megawatt capacity Kingston solar to it's hourly reporting, bringing both Samsung's producing solar and wind facilities to roughly 2/3rd of their total contracted capacity. Even at 2/3rd's, I estimate the cost of that supply to Ontario's captive ratepayers at $38.9 million in November. The market valued Samsung's generation at about $1.1 million. The global adjustment portion of Samsung's costs is therefore about $37.8 million for the month, as the global adjustment is primarily the difference between what Ontario's mandarins guaranteed generators be paid and what the market recovered in selling that generation. November was a low priced month (the HOEP averaging slightly over $10/MWh), but it was particularly low-priced when Samsung's generators could be most productive. The $1.1 million market valuation was of about 248 thousand potential megawatt-hours, meaning the average valuation was ~$4.72/MWh. Over 60,000 megawatt-hours were so lowly valued their production was curtailed. The average cost was closer to $157/MWh, but since well over 25% of potential couldn't even be accepted by the system, the price to Ontarian's of an accepted MWh was closer to $215/MWh. This kind of reckless spending on frivolous supply is precisely why Ontario is introducing programs for the more than 1 in 10 ratepayer households struggling with surging electricity costs. Samsung is only one cost driver, but it's a particularly odious one. Samsung's generators don't have the same rules as others. The new 100 MW Kingston solar connection fronts 140 MW of nameplate solar capacity, and the Grand Renewable's 100 MW ac from 130 MW of capacity.While the overbuild means some curtailment at peaks, it allows Samsung to lengthen the hours of high production. The Grand Renewable Solar Park has displayed 138,000 MWh in the IESO's hourly reporting since only March 25. If it did not produce any output for the remaining 31% of a full 365 day year, it's already at the 16% capacity factor people like myself were using in estimating the shocking costs of the initial Samsung deal. With Samsung now adding $40 million a month to Ontario ratepayers bills and another third of their contracted capacity still pending, it now appears likely the Samsung deal will cost around $60 million each month - for 25 years. This not to have Samsung innovate with solar and wind in Ontario as they innovated with televisions and cell phones in Korea. This to provide the CBC with an opportunity to gleefully misinform viewers.